I’ve driven by dozens of times without even realizing I was passing by a food spot that EVERYONE needs to know about. Mixed in with retail store fronts in Heritage Square shopping center in Fairfield is Bodega Taco Bar, a place you must-try for authentic Mexican food, an extensive tequila selection, and their bodegaritas, or signature margaritas. Bodega has two locations, the original in Fairfield and their second location in Darien, and is the creation of Mario Fantana, Executive Chef Michael Young, and Chef Luis Chavez. Both Bodega locations are on the small side, but the vibe is “underground” and “edgy” with a decor made of reclaimed and repurposed building materials and flea market finds including custom Dia de la Muerta wallpaper and reclaimed and repurposed Yale Bowl bleachers. The decor of Bodega is as unique and innovative as its food creating a memorable dining experience you’ll want to tell everyone about. As owner Mario Fantana explains, “I like to think that a really good restaurant tells a story. To create the Bodega narrative we had to match our interior design and graphics to our vision of what the food would be while driving into more subtle aspects of our identity such ad music and uniforms.” And the Bodega narrative (I love this by the way! I’m all for a good story whether I’m in the classroom teaching or not) or the story of the restaurant, and I’d also add your dining experience, begins with a small, narrow space filled with interesting decor setting the stage for the main characters – Mexican street food and tequila. Bodega describes its food menu as innovative Mexican street food and it features standard fare of tacos, enchiladas, and quesadillas as well as more sophisticated dishes such as Ceviche de Mariscos, Tostada de Tuna Tartare, and Mahi Mahi a la Plancha. There truly is something for everyone on Bodega’s menu, and everything I’ve been able to sample so far is EXCELLENT. Let’s talk tequila! With a drink menu of nearly 100 tequilas (yes, you read that correctly), it is clear Bodega is serious about tequila. If tequila isn’t your thing you might sip on housemade sangria, wine, beer, or bebidas – Bodega’s fun and unique cocktails such as the “Natalie Portman” (read a little further down for more on this one!). 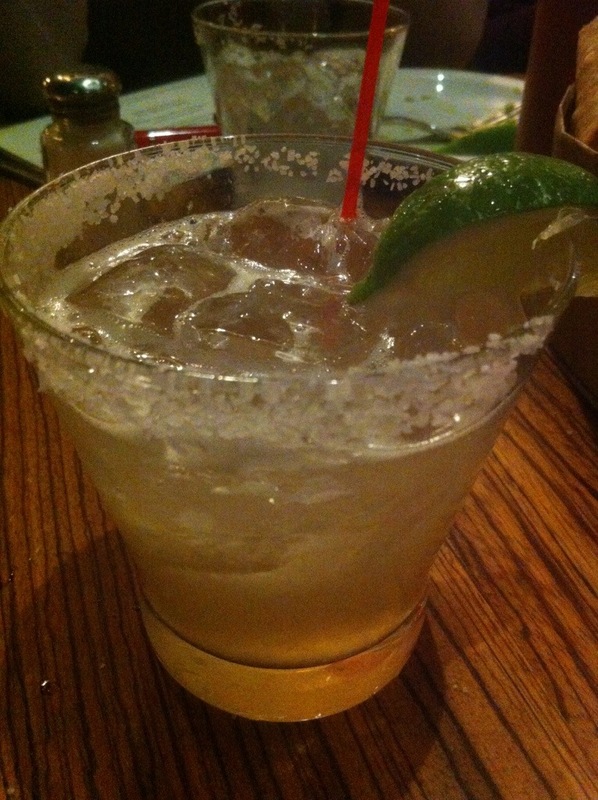 Made with Los generales, luxardo triplum, lime juice, and agave, the Bodegarita is a very good classic margarita. 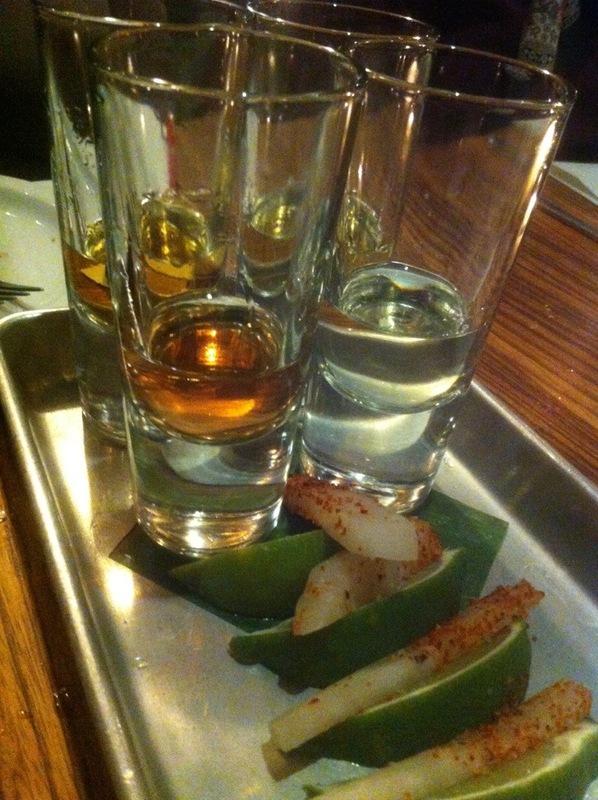 Bodega Taco Bar offers several tequila flights with Gran Centanario being the largest. 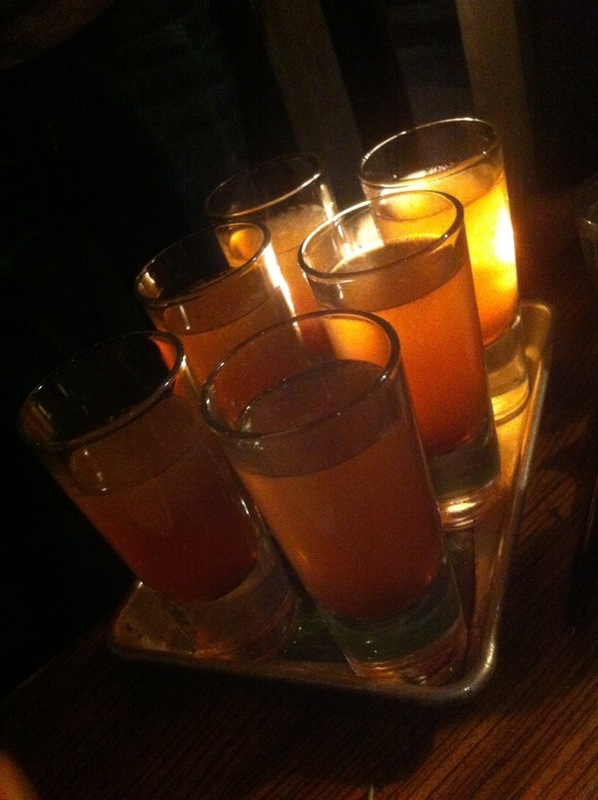 It features Plata, Reposado, Añejo, and Roseangel tequilas. Our table was able to sample the “Natalie Portman,” a specialty cocktail made with gran centenario “roseangel”, lemon juice, agave, and cava. The roseangel is a little sweet, and this cocktail is smooth. 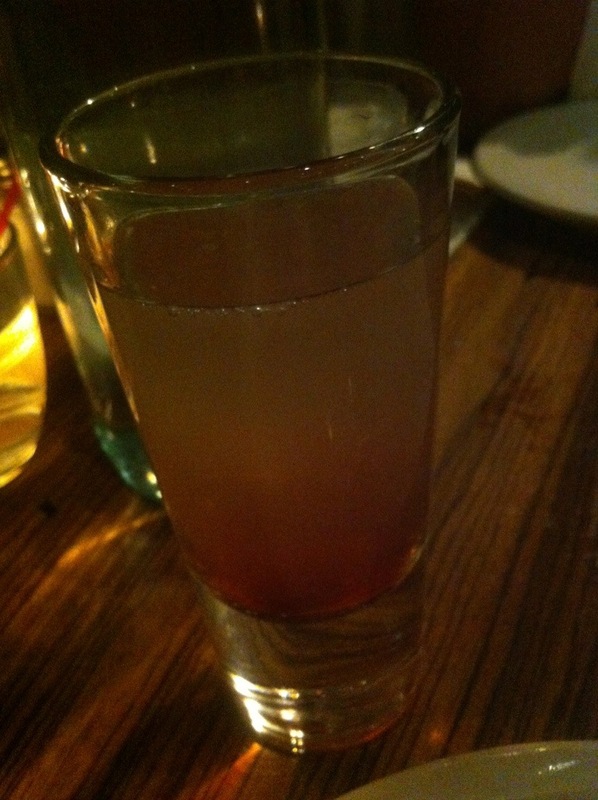 I usually only drink tequila in margaritas, but I would order the “Natalie Portman” again. 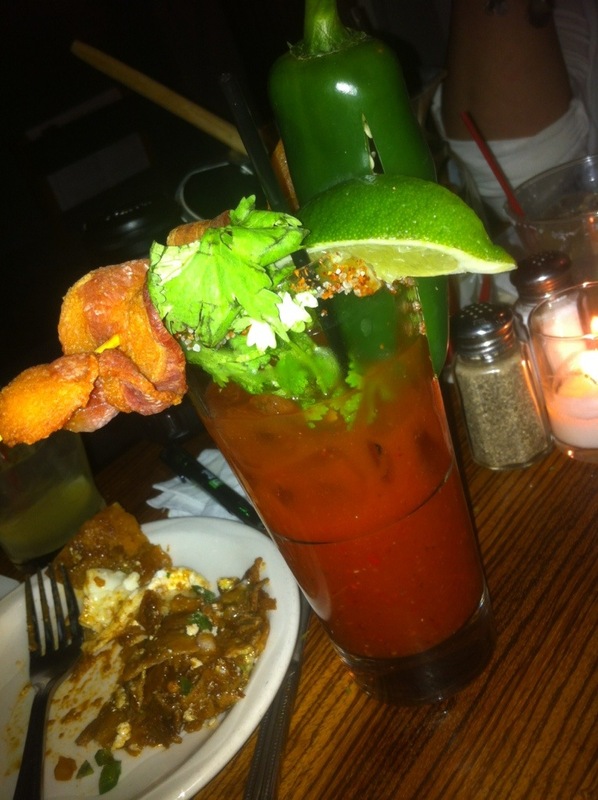 One of my fellow diners enjoyed the Bloody Maria, Bodega’s version of a Bloody Mary. 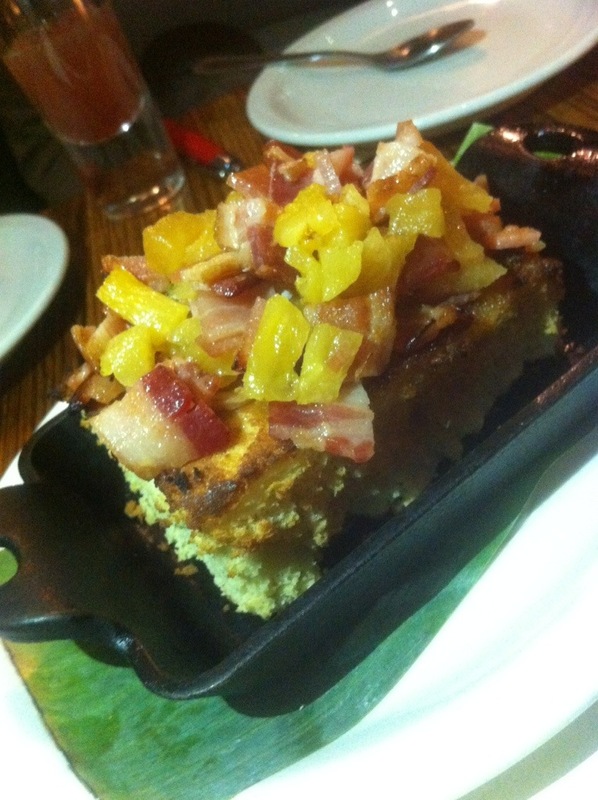 The garnish of a large piece of crispy bacon and a jalepeno is attention grabbing! Made with scorpion resposado mezcal, triplum, mango mash and lime juice, the Bodega Surprise is garnished with a real scorpion! The uniqueness of this drink is sure to grab the attention of both your eyes and your taste buds! 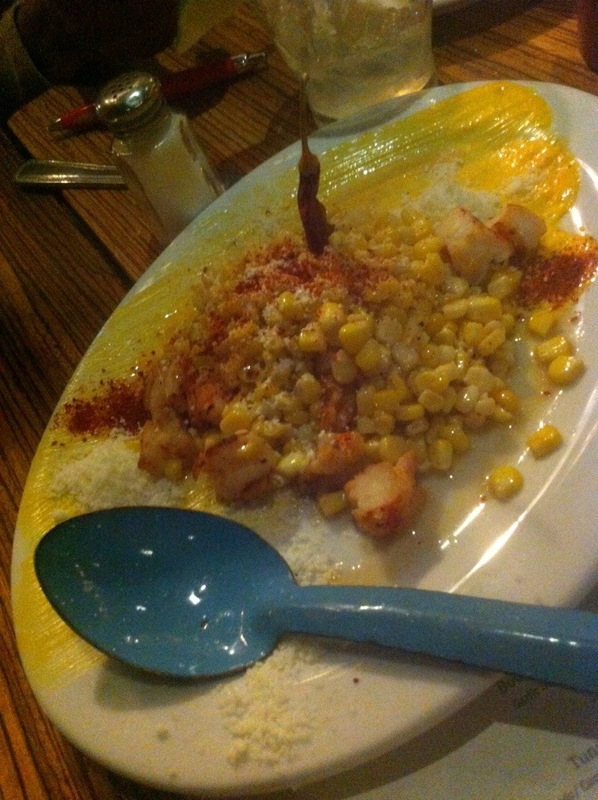 This dish is made of sweet corn, Plancha Shrimp, Cotija Cheese, Chili Dust. When you take a bite of this dish you’ll first notice the freshness of the ingredients, especially the shrimp, followed by the balance of flavors of the shrimp, the sweet corn, the cheese, and a hint of the chili dust. 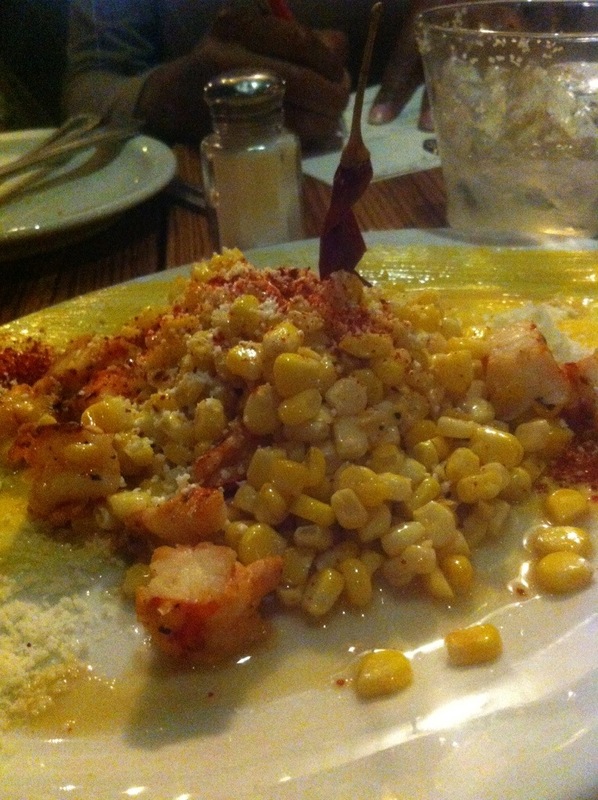 The corn also has a crunch too, adding a nice texture to the dish. Aside from the freshness and the added texture, I also like this dish because it is simple, yet unique and flavorful. Do you like tacos? Do you like chicken? Do you like waffles? This dish puts all three together, yes together, and it is DELICIOUS. 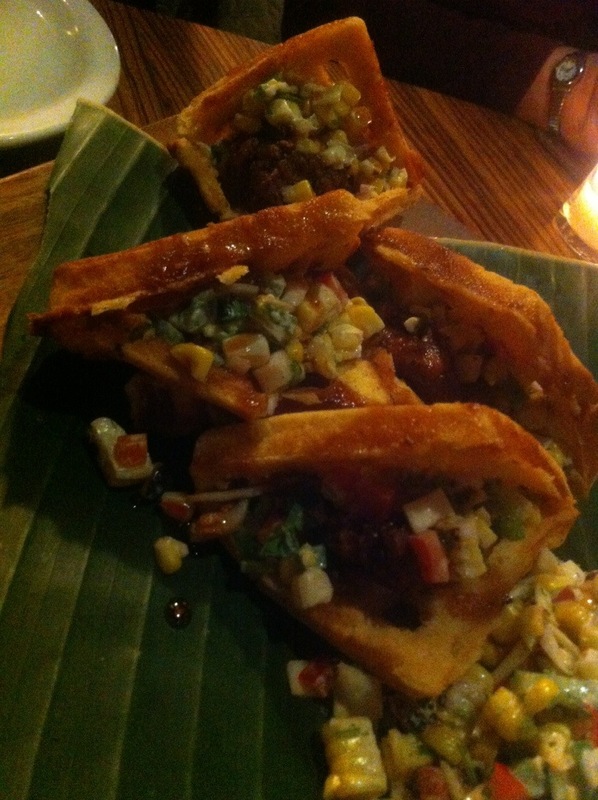 The waffles add a little sweetness to the taco along with chipotle honey that was pleasantly surprising. The corn salsalita reminded me of the sweet corn esquites particularly the crunchy texture of the corn. This dish is on my list of favorite dishes in Connecticut and you must try it. I would visit Bodega just for this dish. Pasilla chili tortillas, poached egg, avocado crema, and queso fresco are the components that make up Chilaqules. The stewed tortillas are very similar in consistency to pappardelle pasta, and they soak up the flavors of the chili sauce. 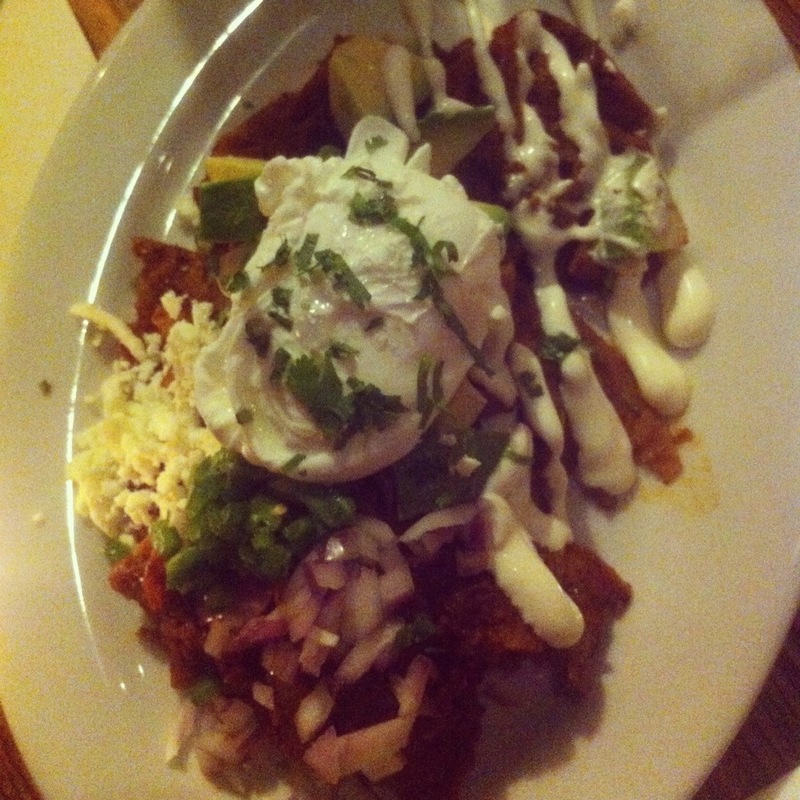 The Chilaquiles dish had also been nicknamed as “the best hangover cure”! Now I cannot attest to the nickname, but a few people nodded in agreement when this was valuable information was shared with our table. Arroz con pollo is a common dish that people are generally familiar with and have tried at some point in their lives. 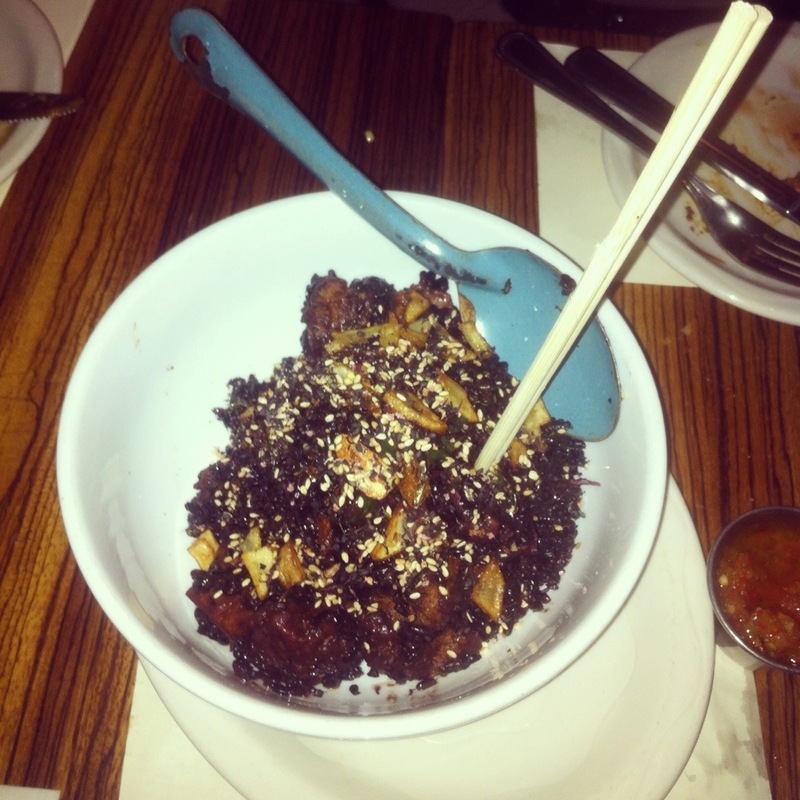 What is different about Bodega’s arroz con pollo is that it is made with black rice and sesame seeds. For me, the black rice has the taste you’d typically expect when eating rice, but visually the black rice is unique and eye-catching. Overall, the poblano, sesame seeds, and crispy potato add both flavor and texture to the dish and along with the black rice make this well-known dish very memorable. 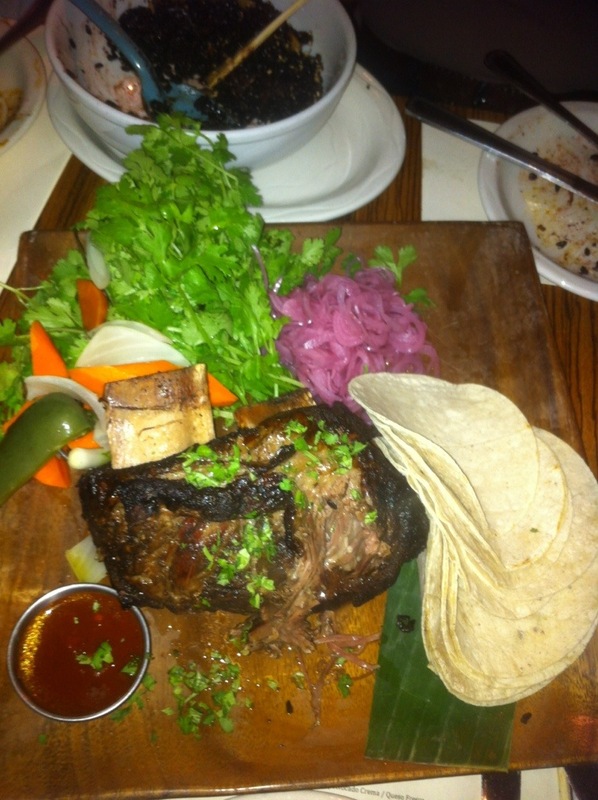 The Matador Majico is described as a meal for four people of braised short rib, curtido de vegetales, and guajillo sauce. The short rib was tender, juicy and flavorful. When you go to take a piece the meat easily falls off the bone and it was delicious alone or added to a soft tortilla and topped with the vegetables and guajillo sauce. 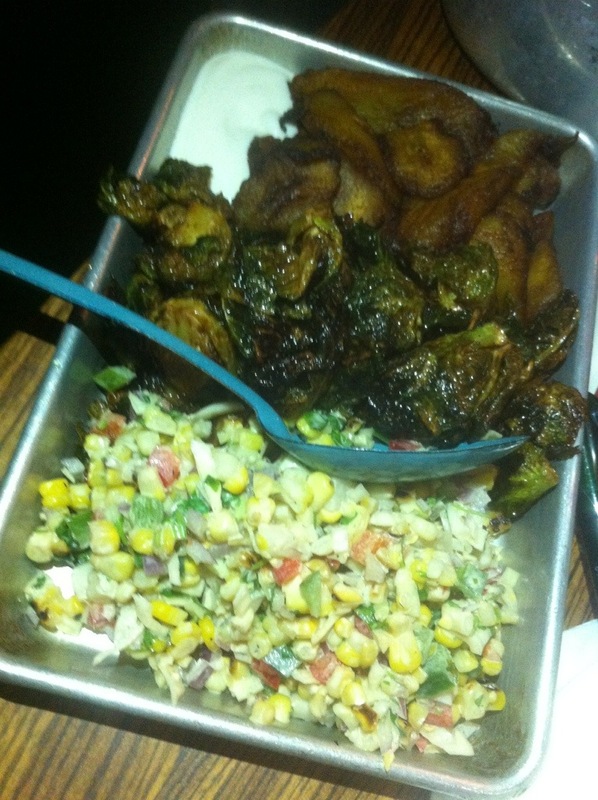 Plantanos con Crema (top), crunchy corn slaw (center), Blistered Brussel Sprouts are the three sides you get when you order the 3 for 10 Sides. I have to confess I didn’t understand what all the hype was about lately for Brussel sprouts until I had the blistered brussel sprouts side at Bodega, and now I get it. When these little vegetables are grilled and seasoned well they have a slightly crunchy texture and they are worth trying. 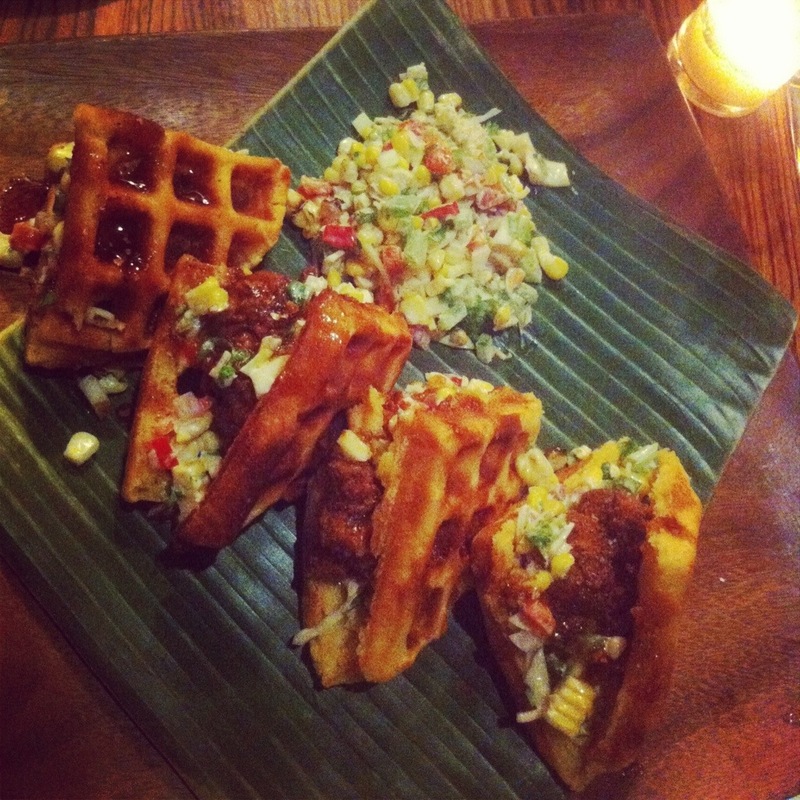 The plantains are a little sweet, soft in the center, and the Crunchy Corn Slaw is a fresh mixture of corn, tomatoes, and onions (it is also served along with the chicken and waffle taco -see above). The paella is as fresh and flavorful as all the other dishes we tried at Bodega and it was a big hit with everyone at our table. 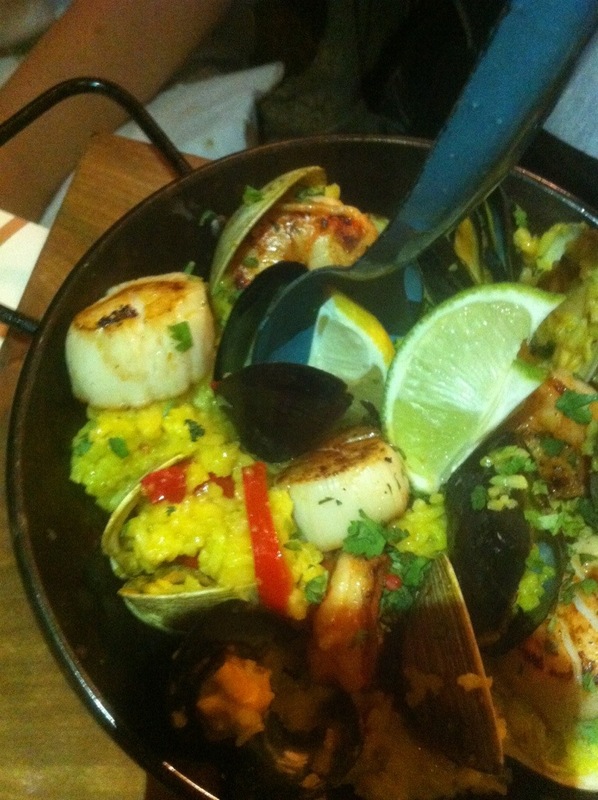 The rice really soaks up the flavors of the shrimp, scallops, clams, mussels, calamari, and saffron. The classic vanilla cake is served warm and has a light consistency that reminds me of a sponge cake. While some may find the cake plain, I believe it is perfectly paired with the sweetness of the fresh pineapple and candy bacon. The candy bacon has a chewy consistency and it is sweet, but it is not overpowering. The S’mores Fundido is a twist on the classic. Made in a small cast iron skillet, this dessert is melted chocolate topped with gooey marshmallow and accompanied by canela dusted tortillas. The canela dusted tortillas and the fun of scooping the melted chocolate and marshmallows out of the skillet are what really make this dessert unique. 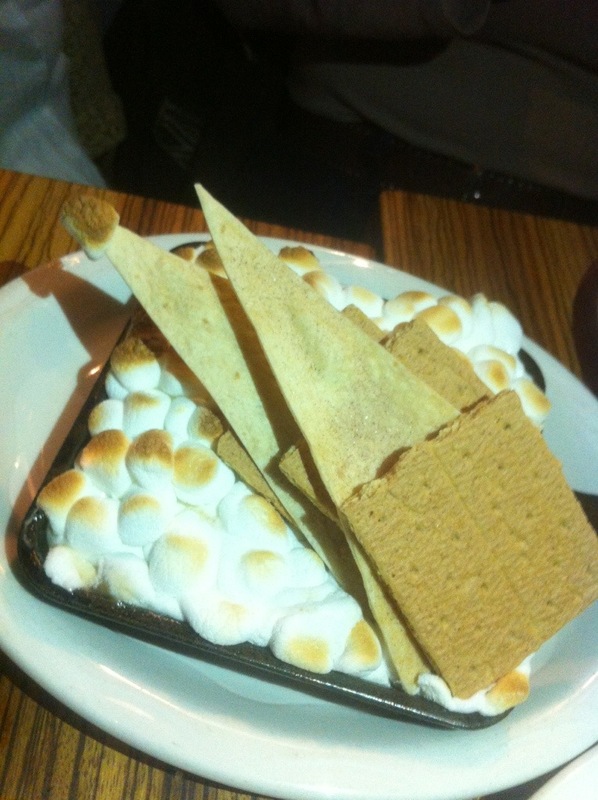 The S’more Fundido is perfect to share. “The Bodega narrative” is a memorable one of fresh ingredients, and classic flavors and dishes with unique twists that I know you will enjoy! Disclaimer: I was invited to this sampling dinner by Bodega Taco Bar, however the views and opinions expressed herein are my own.